Make a batter by mixing the flour with 1½ cups water. 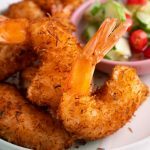 Dip each prawn into the batter and then coat in the coconut. Set aside on a tray until ready to cook. Fill a saucepan or wok to about 1/3 capacity with the vegetable oil. Heat over high heat. Once the oil is hot (325°F or 165°C or when a wooden spoon dipped into the oil forms small little bubbles) cook the prawns for 1-2 minutes or until golden. Flip them a couple of times as they cook to ensure an even colour. Drain on kitchen paper. Serve with the Thai cucumber relish.